Back from Ghana, hopping like a one-legged placekicker with a hotfoot, bizzy bizzy bizzy. Over the course of this semester I’m going to record an album that reflects the Ghana experience. You can check out the first three downloads (Road to Prestea, Sunrise in Mole, and the now-infamous Goat on a Stick) at my Soundclick page. Registration is required, but it’s free. You can listen directly from the site or download. If you download, be aware that the MP3s filenames are wrong. CURSES! There are other songs there too, and you can feel free to check them out as well. (I’m not posting any cover versions due to legal mumbo-jumbo). 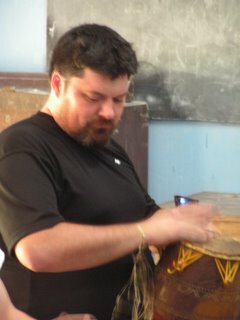 But I did get a day worth of drum lessons in Africa from a real instructor. How cool is THAT? Welcome back Willie! Thanks for serving Jesus and the people of Ghana. With havin so much content and articles do you ever run into any issues of plagorism or copyright infringement? My blog has a lot of completely unique content I’ve either created myself or outsourced but it appears a lot of it is popping it up all over the internet without my permission. Do you know any methods to help reduce content from being stolen? I’d truly appreciate it.